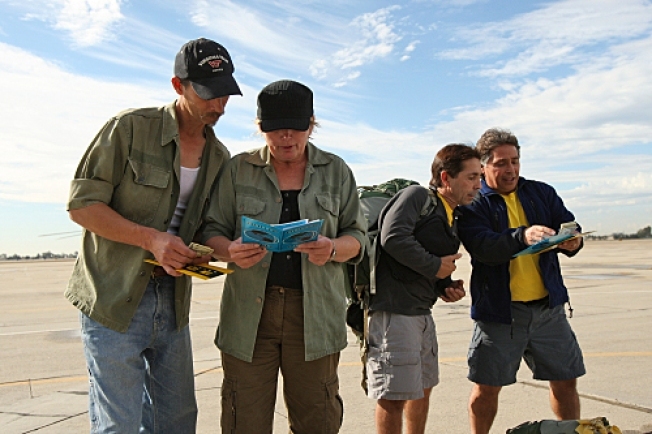 Married couple Steve and Linda (left) and brothers Mark and Michael at the start of THE AMAZING RACE 14 at Los Alamitos Army Airfield in Los Angeles County. If you're not into the DIY Amazing Race packages, and want the real thing, cameras, breakdowns and crazy competitors included--it's casting season for the Amazing Race. If you made it onto the show, you'd be part of the 15th season, which -- if judging by the application -- will have swimming challenges in it. Other information you'll need to cough up for the application: all manner of details about your teammate, including your pet peeves, disappointments and communication issues with your proposed partner. You'll also need to come up with a juicy answer for the statement "Describe your perfect day." Once you've filled out the lengthy PDF (downloadable here) you then take those forms, your passport (or completed application for one) and another passport sized photo down to one of their 13 casting calls around the country and have the teams there shoot a three-minute video of you and your partner for consideration. Once all that's done, you sit back, wait, and press refresh on your inbox. A full list of casting centers after the jump. March 14, 10 a.m.-4 p.m.
March 14, 10 a.m.-2 p.m.
March 16, 10 a.m.-5 p.m.